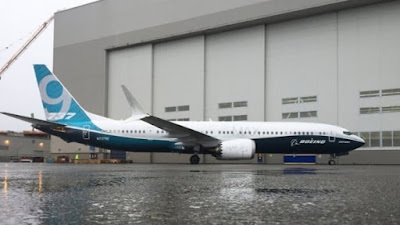 Boeing rolled out the first 737 MAX 9, the second variant of the re-engined 737, at its Renton, Washington facility March 7. The 737 MAX 9, which is 138 ft. and 2 in. long, has a maximum capacity of 220 passengers and a range of 3,515 nm. The aircraft’s first flight is expected “in the coming weeks,” according to Boeing. The CFM International LEAP-1B-powered MAX 9’s debut comes just over 13 months after the MAX 8 achieved its first flight. The 737 MAX 8 is expected to enter service this summer with Norwegian Air Shuttle. Southwest Airlines, which placed the launch order for the 737 MAX, is expected to place its first MAX 8 into service Oct. 1. The first 737 MAX 9 prototype “now begins system checks, fueling and engine runs on the flight line,” Boeing said. The 737 MAX 9 is scheduled to enter service in 2018. Boeing has secured more than 3,600 orders for 737 MAX family aircraft from 83 customers, including more than 400 orders for the MAX 9. The new 737 MAX 8 will deliver the highest efficiency, reliability and passenger comfort in the single-aisle market with 20 percent lower fuel use than the first Next-Generation 737s – and 8 percent per seat lower operating costs than the A320neo. The 737 MAX will extend the Next-Generation 737 range advantage with the capability to fly more than 3,500 nautical miles (6,510 km), an increase of 340 - 570 nmi (629-1,055 km) over the Next-Generation 737. The 737 MAX family has 3,072 orders from 62 customers worldwide.